Does Business Need a Heart Change? What words do you think of when you think of business? Do you think of words like money, performance, results, control, and fear? Or do you think of words like honor, team, relationship, connection, and fun? Most likely you associate business with the first list of words. But if Bob Hasson and Danny Silk have their way, you will link business with the second list of words. Hasson and Silk have co-written a seminal work with The Business of Honor. As soon as I saw the promotional information his publicist sent me about the book, I knew that I had to read it. I had high expectations about this book, and I was not disappointed. Whether you are a business leader, a ministry leader, or a leader in your home, you will benefit from reading this book. 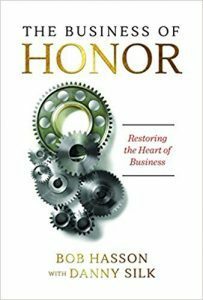 After reading The Business of Honor, I had the opportunity to interview Bob Hasson. Here are excerpts from the interview, complemented by my thoughts. The Business of Honor starts off with a study in contrasts in the first chapter looking at the culture and legacy of the centuries-old Guinness brewing company, next to the culture and legacy of the scandal-plagued Enron. While they had similarities, they had some striking differences amid the similarities. The most striking contrast between Enron and Guinness was the similarity between them. Both founders espoused Christian values, were sons of preachers, and were philanthropy-minded. But Enron was enamored with money and net worth: Kenneth Lay wanted the company to be the most valuable company on earth. Arthur Guinness, on the other hand, focused on serving people by providing good jobs and products that transformed his country. Culture is important in any company. The culture of an organization is how the people relate to each other, and the culture is determined by the leader of the company—whether it is intentional or not. In addition, the interior culture is supposed to be aligned with the exterior brand of the company. But that wasn’t the way it was at Enron. In the work environment, Enron was solely focused its company ranking on the Fortune 500 list and stock price. They said all the right things in public and plastered banners around their campuses about the company’s great culture. But behind the scenes, they were focused only on productivity and results to the point of committing accounting fraud. Relationship and connection were not part of the organization as a whole. But relationship and connection are crucial parts to a healthy organizational culture. Most businesses have cultures where people experience shame, mistrust, and powerlessness. Hasson and Silk remind us that business can and should be places where people can be vulnerable, trusted, and powerful. You as a leader must be prepared to create a culture that will honor the people around you. But be aware that the culture of your organization starts with you—not just in how you treat your people, but also in how you view yourself. Your identity will affect how you treat everyone else at your organization. The Business of Honor discusses the importance of identity and contrasts the identity of an orphan with the identity of a son or daughter of God. An orphan can have a single parent or two parent family, where parents work 60 hours a week or the single parent works three jobs. Orphans may have one or more parents to take care of them, but they feel like they have to fend for themselves. If you’ve lived your life feeling that you have to take care of yourself, then you’ve excluded God—in some areas you trust God, but in other areas you feel you have to control those outcomes. You have to know that you know that you know that God will take care of you. That transformation is huge. As a result, you can conquer the things that hold you back. But these things don’t happen right away. This journey is like a peeling of an onion skin. While that transformation may take a while, it can have a profound impact on how you view yourself and everyone around you. Most business cultures are not healthy because most business leaders do not have a healthy view of themselves. As a result, these businesses have cultures of dishonor. In business cultures where people are dishonored, people feel shame and are isolated from each other. Bob Hasson knows that full well because of his own personal experience. Now he wants to help other people make that change. Our definition of honor is two parts: first, treat them the way they deserve, and second, treat them the way God does. Most businesses have salaries as their largest expense. Our relationships are the most important and valuable resource we have. It’s our opinion that’s why we need honor in business. I want leaders to be set free from isolation and shame, so companies can have better success. Hasson and Silk believe that the culture of business will eventually change from dishonor to honor. But it will take individual leaders changing the culture in their particular businesses. We need reformation in business culture and it’s not going to come from government or regulatory agencies; it’s going to come from heart changes in people and leaders, and that heart change is going to be a new value in business for taking care of the company by protecting relationships. For more information about Bob Hasson and Danny Silk or The Business of Honor—or how to change your business from a culture of dishonor to a culture of honor—visit www.businessofhonor.com or www.lovingonpurpose.com. What do you think? Share your thoughts with your friends. You can share this article on Facebook by clicking here. The post Does Business Need a Heart Change? appeared first on IMPACTFUL LIVES.